Does blockchain technology hold promise for print manufacturers in the IoT world? The Internet of Things (IoT) is a world of connected devices embedded with software and network connectivity, that encompasses everything from thermostats, through to wearable devices and autonomous vehicles like the Tesla Model S. Sensors and connectivity are the foundation of the IoT revolution. This is enabling a shift from transactional sales models to service models that exploit the value of data generated through user interaction with connected IoT devices. While the print industry has already started its service transformation journey, more opportunities will lie ahead as IoT converges with the distributed ledger technology known as blockchain. Smart multifunction printers (MFPs), with networked connectivity and embedded software platforms, are an integral element of the Internet of Things (IoT) landscape. Networked printers and MFPs generate a wealth of data which is used for remote monitoring, predictive service and maintenance and just-in-time delivery of consumables such as ink and toner. Network connectivity of course raises security concerns. As IoT devices, printers and MFPs are vulnerable to the same security risks as any connected device. These include access to data on hard disks, unclaimed confidential output falling into the wrong hands or unauthorised access to the network via open ports on the device. Fortunately, such risks can be mitigated through a range of measures at a device, document or user level and devices can be remotely managed through the cloud or central server. However, as IoT landscape becomes more diverse, the need to manage and protect the proliferation of devices and associated data becomes a priority. Enter blockchain technology, a potential means of authenticating device and user identity, protecting data and processing transactions. Blockchain technology is a way to add security and privacy to sensors and devices. Blockchains, which powers cryptocurrencies such as Bitcoin, is a distributed ledger – or list, of all transactions across a peer-to-peer network. From a functional standpoint, the blockchain provides a decentralised, time stamped, ordered record of all transactions in a network, such as Bitcoin, that can be verified at any time. The ledger is tamper-proof and cannot be manipulated maliciously so makes trustless, peer-to-peer messaging possible. The distributed ledger makes it possible to keep track of assets, without the need for a centralised server. So, in an IoT network, a blockchain can keep an immutable record of the history of smart devices. This feature enables the autonomous functioning of smart devices without the need for a centralised authority. The potential applications for blockchain can impact the complete supply chain, from assembly to end-of-life. Blockchain technology could provide a way to track the unique history of individual devices, by recording a ledger of data exchanges between it and other devices, web services, and human users. The blockchain ledger could be extended to register updates, patches, and part replacements applied to any product or device throughout its lifetime. This would make it much easier to track progress in removing security vulnerabilities and to send out warnings and notifications to product owners. Smart contracts promise to take blockchain to the next level, enabling devices to do more than just exchange information. Blockchains can enable smart devices to become independent agents, autonomously conducting a variety of transactions. Consider a printer that can diagnose, schedule and pay for its own maintenance or pay for consumables automatically, based on the purchase history. Or a fleet of printers that negotiate with other devices for priority so that they run at an appropriate time while minimising the cost of electricity. 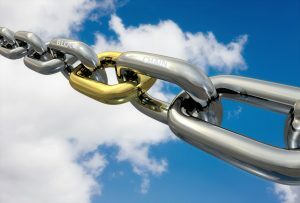 Meanwhile, easily tracked and authenticated blockchain data from connected MFPs gives manufacturers more and better data about how their products perform over time, enabling them to improve quality. This also helps them drive more lucrative sales and services such as proactive replacement of consumables and parts. Companies can use the same blockchain to store metadata on which users have used an MFP, as well as record their usage. Immutable records of when PIN numbers were used to pull a print job from a network storage device, or logs of document scans being made by a user and exactly where the scan result went to can be useful in managing both internal and external governance. Blockchain technology and standards are still emerging but the concept offers fascinating possibilities for the print industry. There may still be many technical obstacles to overcome, but it has the potential to be the missing link to address scalability, privacy, and reliability concerns of printers in the ever expanding IoT world. It will be interesting to see if this catches on, especially in the small- to mid-sized markets.